In an interview discussing the collection, Vanessa Page alludes to personal experiences and observations as sources of inspiration, implementing memories into different settings in order to create adaptable, relatable fictions. In this sense, the collection is highly effective. As the title indicates, there is an overarching focus on ‘unpacking’ memories and perceptions, but unlike a conventional confessional box, Page’s collection is not exclusive or exclusionary. However, it is certainly not a passive receptacle, nor are Page’s speakers demure confidantes. Page relishes familial settings and romantic encounters between her speakers, but connections are often fraught with what has been left unsaid, metaphorically and literally distanced by a range of imageries. tail lights warning you back. Tension between natural features and human constructions is played out across the woman’s body. Page’s speaker observes the ‘otherness’ that is the ‘wife’ and her many categories of non-human features, while also lapsing into accusing tones and confrontational second person pronouns. The speaker’s pause and reference to ‘a sudden domestic sketch’ highlights time as another form of distance, suggesting anxiety about this as a potential future state, and the passive warning that the viewed female figure offers via her ‘tail lights’. Criticism in this poem is not levelled at the depersonalised wife, but rather at her lack of voice and human qualities, and also questions the speaker’s activity in response. a thousand more sunburnt days. The image cements her almost affectionate critique of this isolated figure, locating the patriarch in a romantic, stockman’s role and simultaneously away from the immediate lives of other human figures. and the miles of emptiness drawn out between. Throughout the collection, human relationships prevail in spite of such distances, but are certainly not spared from criticism. 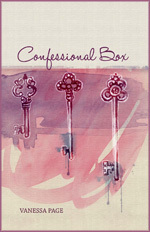 Confessional Box immediately appears to deal exclusively with personal memories and emotions, but quickly reveals much broader themes, complete with technical links throughout the collection, and a sensitive focus on human experiences throughout. This entry was posted in BOOK REVIEWS and tagged Siobhan Hodge, Vanessa Page. Bookmark the permalink. Siobhan Hodge has a PhD in English literature. Her thesis focused on Sappho’s legacy in English translations. Born in the UK, she divides her time between Australia and Hong Kong. Her chapbook of reflections on Sappho, Picking Up the Pieces, was published in 2012 as part of the Wide Range Chapbooks series. She is currently the Reviews Editor for Writ Review and an Associate Editor for Rochford Street Review. She has had critical and creative works published in a range of places, including Westerly, Axon, Contrapasso, Peril, Plumwood Mountain.